My most recent trip was returning to Seattle in early October. The purpose of this visit was that one of my Kauai friends wanted to go to a Seattle Seahawks football game for his birthday, plus my dad was also turning 80 the following weekend and I wanted to celebrate it with him. It had been several years since I had experienced fall, so I also planned on visiting the North Cascades. I drove up to the Methow Valley with my buddy Tom and we spent 2 nights in a friend’s beautiful cabin near Mazama. The weather was ideal with clear blue skies and crisp autumn air. One afternoon, I decided to revisit a location where I had photographed one of my favorite abstract images almost 20 years ago. I found this fallen leaf tranquilly marooned along the river’s shore and maneuvered my camera into position to include the contrasting yellow-orange trees and blue sky reflection. I especially like the water ripples in the reflection that add another dimension to this beautiful composition. Picture Lake is one of the most iconic, and thus photographed, locations in my home state of Washington. The reflection of Mt Shuksan from the lake on a clear day is postcard perfect. In September, I returned to Picture Lake for the first time in a several years while instructing 2 private photography tour clients from Mexico. They had never been here before, so they were giddy with the perfect shooting conditions. Over the years, I have sold my original medium format film image of this scene numerous times, but I prefer this updated digital photo to the original. I created this image with my Canon 5DmkII, Carl Zeiss 35mm f2 ZE lens, and Singh-Ray LB Warming Polarizer and 4-stop Soft Graduated Neutral Density filters on a tripod with minimal processing in Aperture 3. As always, the secret ingredient of this image was lots of patience waiting for hikers to walk out of the scene and a perfect reflection when the breeze stopped blowing. I spent last Thursday and Friday photographing the sockeye salmon migration on the Adams River in central British Columbia. It was a miraculous sight to behold! Every 4 years the salmon return in huge numbers. However, they had not returned in as great a numbers as this year since 1910. The relatively short life cycle of the salmon is amazing when you consider that when they are born they swim in Shuswap Lake for a year before descending the Fraser River, migrating to the North Pacific Ocean, and finally returning to the river of their birth by swimming past orcas, fisherman, and the city of Vancouver to lay their eggs before dying. Though the young salmon never meet their parents, the accumulated biomass of their decaying parents nourishes the lake and thus the young salmon in their first year of life. The epic journey of the salmon is a story about determination and rebirth. During my previous visit to the Adams River in 2002, I was just beginning my photography career. I had no idea what I was doing with an underwater housing. Plus, I was limited to only 36 exposures on a roll of film, which made it a real pain getting out of the water to change film. Using my Canon 5DmkII and 17-40mm f4 lens in my Ikelite 5DmkII housing with an 8″ dome port and dual DS 160 strobes, I am now able to create over 600 exposures on my 16GB Sandisk Extreme cards. My recent shoot was no longer limited by technology, but more by my patience and willingness to sit on my knees in the middle of the river while wearing my drysuit for hours at a time. I perfected my technique of shooting “blindly” by positioning myself in the river so that an eddy formed downstream of my body where the salmon could congregate and then I lowered my housing into the water to fire away at 4fps without looking through the viewfinder. Clearly, there was a lot of room for error in my positioning of my camera in this manner, because I had to delete a lot of images. I was inspired to create this image as the sun was just starting to rise over the tops of the trees in the late morning. The salmon were backlit, so I used my strobes for a bit of fill-flash. I did not have all my correct strobe arm parts with me, so I attached one strobe to my housing in the vertical position on the left side and hand-held my other strobe against my knee with my right hand. I was able to push the shutter release button with my left hand while balancing my housing against the river bottom. My strobes were set to -3 and the rest of this image was just pure luck that I guessed correctly of how to angle my camera. I do not like to do very much post-processing, but I had to digitally remove a significant amount of backscatter that was caused by my strobes illuminating the particulates in the water. My overall point in this long description is that there was a lot of technical challenges as well as blind luck required to create this beautiful image. Update on 10/23/10-For anyone who might be concerned about my photography interfering with the salmon, I had a permit from the Department of Fisheries and Oceans (DFO) that allowed me to be in the water. The most important thing I teach my photography tour clients is how to anticipate a shot. 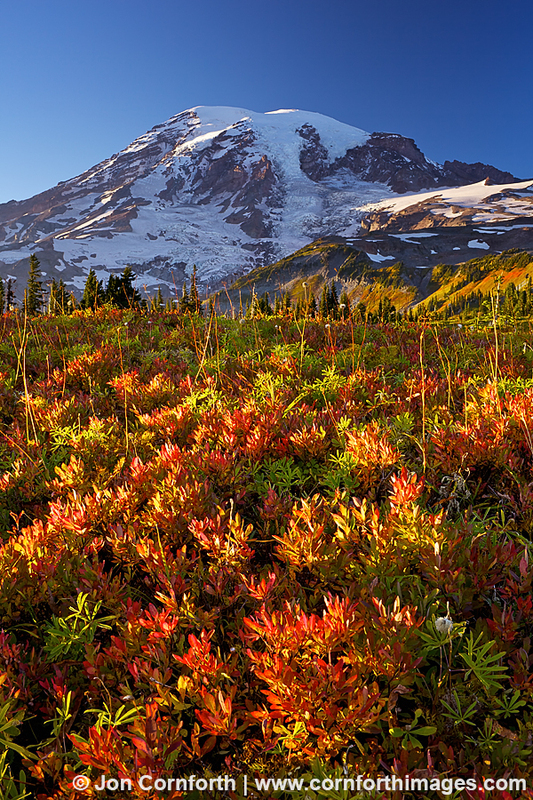 Let’s use my new image of the fall colors on Mazama Ridge as an example of when to shoot. When I was at Mount Rainier National Park last Friday, the sky was clear blue without a single cloud on the horizon. I knew that the best image in these conditions would be when the angle of the sunlight was a few degrees above the horizon and still yellow or orange in color. Experience has taught me where the sun would go down, but I confirmed my guess by using my SunSeeker app on my iPhone. I wanted to shoot this scene as the sunset light settled into the trees and danced across the foliage in front of my camera. The tree shadows added some mystery to an otherwise beautiful but non-dramatic scene. This light only lasted for about 30 seconds before the foliage went into complete shade. I used my Carl Zeiss 35mm f2 ZE lens along with my Singh-Ray LB Warming Polarizer and 2-stop Hard Graduated Neutral Density filter to create this image using only 1 exposure which required minimal processing. Last week, I helped 2 photography clients from Mexico City experience and shoot Washington’s fall colors. With all of my travels out of state, I no longer have as much time to shoot when I am home, so it was nice to do some photography in my old stomping grounds in the Cascades. For some reason, every time that I have been out shooting in the last month, I have experienced clear blue skies which has made dramatic light conditions very difficult to find.Of course, there are worse things than driving around in the mountains on sunny days. On the first day of our time together, precipitation clung to the North Cascades as I drove up I-5 to Picture Lake. I thought that our timing would be ideal for photographing fall colors and was not disappointed. As the clouds swirled and briefly parted late in the afternoon, my clients and I were able to photograph Mt Shuksan’s perfect reflection. The sun sets behind a mountain ridge at about 4:30, causing the foreground and trees on the opposite side of the lake to usually become too dark, but on this afternoon the lifting fog helped to soften the harsh shadows. I used my Singh-Ray LB Warming Polarizer slightly backed off from full polarization along with my Singh-Ray 4-stop Soft Graduated Neutral Density filter placed above the foreground foliage to balance the exposure. I also chose to photograph this scene with my Carl Zeiss 35mm f2 ZE lens in order to keep Mt Shuksan from becoming too small in the overall composition while still being able to have enough depth of field at f16 to include the foliage along the shore in the foreground.